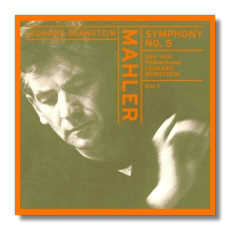 Fans of Leonard Bernstein's conducting are better served than ever before. 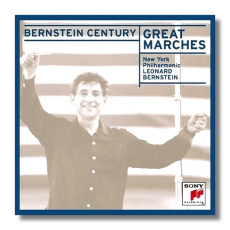 Sony Classical's new "Bernstein Century," though, is a curious affair. Of these 16 initial releases, many are literal repackagings of earlier CDs, such as those in the 100-volume "Royal Edition." Others are reissues of performances that have not been available since the LP era, and very welcome they are too. The new 20-bit remasterings, however, are consistently fine, and the presentation is more sensible than in the past – no more watercolors by H.R.H. The Prince of Wales! 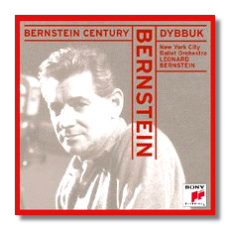 Most of the CDs pair Bernstein with the New York Philharmonic. Concerto for Piano #5 in E Flat Major, Op. 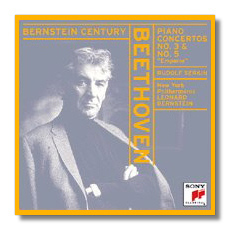 73 "Emperor"
Those same qualities are present in Bernstein's New York recordings (1962-4) of the Third and Fifth Piano Concertos, which are on SMK63080. The pianist is veteran Rudolf Serkin. He and Bernstein make the "Emperor" swagger. Bernstein and the Metropolitan Opera made a superior Carmen for Deutsche Grammophon in the 70s. However, when he recorded suites from the opera in 1967, the results were ho-hum. Here, this is skating-rink music – Carmen for people who hate opera. It doesn't help that the selections are haphazardly arranged. The two suites from L'Arlésienne which follow are much better. This time around, Lenny is engaged and engaging, and Bizet's piquant voice rises like cream to the top of the New York Philharmonic (SMK63081). Aaron Copland had a sort of propinquity with the charismatic Bernstein. They met in 1937 and they remained friends and musical colleagues until their deaths in 1990. 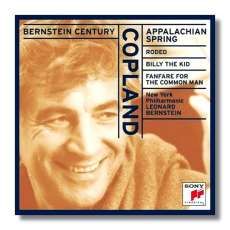 SMK63082 is a solid collection of the popular Copland: Appalachian Spring, Rodeo, Billy the Kid, and Fanfare for the Common Man. These recordings were made between 1959 and 1966. 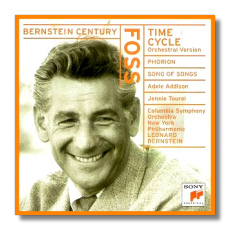 Bernstein loved and recorded this music very well, and yet a little less facility wouldn't have hurt. It is curious that the version of Fanfare included here is taken from the conductor's recording of the complete Third Symphony. That, in its first appearance on CD, can be heard on SMK63155, along with the Symphony for Organ and Orchestra, with E. Power Biggs, organist. Again, the performances are highly accomplished, if more redolent of American steely smoothness than of rusticity. 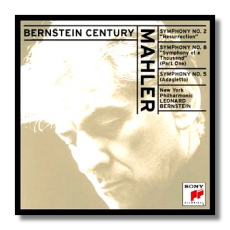 Symphony #2 in C minor "Resurrection"
Some recordings are so good they never go away. That's the case with the contents of SMK63085, a document of Lenny's ebullient and infectious self-love. 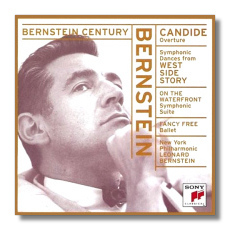 I've lost count of how many times these versions, recorded in New York in 1960-63, of the overture to Candide, the Symphonic Dances from West Side Story, the suite from On the Waterfront, and the ballet Fancy Free have appeared on LP or CD. It's no surprise: Bernstein pulls out the stops in this handful of his strongest works, and the results are irresistible. If you've waited this long, stop! 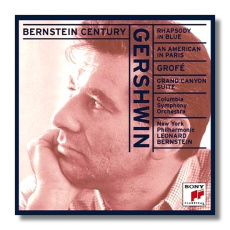 Surprisingly, Bernstein soft-pedals the jazz in George Gershwin. Conducting from the piano in Rhapsody in Blue, he whips up a beefy orchestral outside and a sentimental inside. If you can accept the wrong-headedness of this approach, these recordings, from 1958-9, are fabulous, and well worthy of their historic status. Listen to the orchestra rip into the charleston in An American in Paris and you'll be convinced. Grofé's Grand Canyon Suite, which closes the CD, often gets put down, but Bernstein makes sure the New York Philharmonic plays it lovingly. Too bad the 1963 vintage sonics are unflattering, considerably less fine than in the Gershwin (SMK63086). 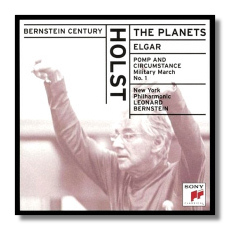 By 1971, the year Bernstein recorded The Planets (SMK63087), he had vacated his position as the New York Philharmonic's Music Director. Holst's suite has zip, though, as if Bernstein wanted to show that he could keep up with his younger colleagues. "Mars" is too fast to suggest the general menace of war; this is a battle in a sci-fi movie. Even so, it is easy to like this performance, thanks in no small part to the Philharmonic's luscious playing. Elgar's Pomp and Circumstance March #1, recorded in 1967, rounds out the disc, which still is shy of an hour. SMK63088 begins and ends with Élégies. 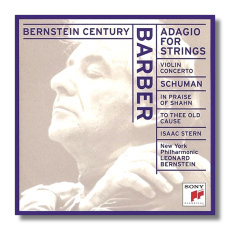 Barber's Adagio for Strings (recorded in 1971) is eloquent and well-shaped, glassy strings notwithstanding, and the closing item, William Schuman's In Praise of Shahn (1970) is really special – a psychological portrait of a fine American painter who died in 1969. In between, Barber's Violin Concerto (1964) gets a superb performance by Isaac Stern, and the emotional To Thee Old Cause (1968), also by Schuman, reinforces the impression that here's an American composer who deserves more attention, both at home and abroad. This is one of the present collection's best discs, and a first release on CD for the Schuman works. 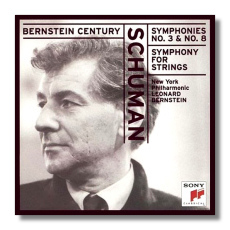 Symphony #5 "Symphony for Strings"
More Schuman, also new to CD, is on SMK63163. Don't miss this one, because it contains three of the composer's strongest works: the Symphony for Strings, and the Third and Eighth Symphonies. 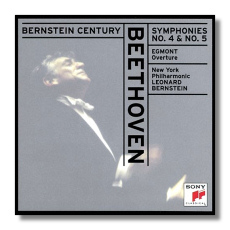 Some people think Schuman's rocky Third is the greatest American symphony, and after hearing a performance like this one (recorded in 1960), I'm not inclined to disagree. Another American composer relatively (and unfairly) neglected outside of his country is Lukas Foss. Foss is fond of surprises – there's no guarantee that he'll maintain stylistic similarity from one work to the next. Three of them are on SMK63164. Time Cycle is a free-wheeling piece of serial experimentalism, but no dry academic exercise for all that. It's a set of four songs (sung here by Adele Addison), with three improvised interludes. Phorion, a movement from a larger work, is a "nightmare" based on Bach's Violin Partita in E. Song of Songs, the only one not new to CD, is an appropriately lush sensuous setting of the Song of Solomon. The mezzo-soprano is Jennie Tourel, who frequently recorded with the conductor in the 50s and 60s. As for Bernstein, he understood this music, and these world première recordings are stamped with his authoritative vision. 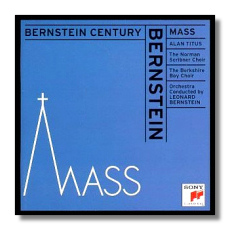 Bernstein's Mass has appeared on CD three times – surprising for work that received so much bad press upon its debut and subsequent recording in 1971. This latest incarnation (SMK63089, 2CDs) is another chance to be reminded that, spiritual as it is, this is not a sacred work at all. Instead, it's a full-blown theatrical extravaganza based upon and commenting on the Roman liturgy. Wildly eclectic, it sets up collisions between serious classical music, Broadway, and 70s rock. These collisions might sound tragically hip today, but I think Bernstein touched something honest in himself in this work. The Mass is about faith sought, found, professed, challenged, destroyed, and recycled. It's also an entertaining time-capsule – get out your headband, baby. Dybbuk (SMK63090) is Bernstein's numerological ballet about demonic possession – imagine Le Sacre du printemps played by a klezmer band. In spite of the interesting conjuction, it's never made much of an impression on me, although it's better on this recording from 1974 than on the Deutsche Grammophon remake. The orchestra is that of the New York City Ballet. 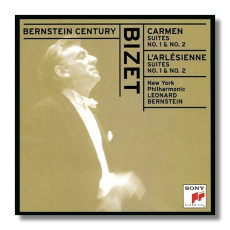 Claude-Joseph de Lisle: Chant de guerre pour l'armée du Rhin "La marseillaise"
Georges Bizet: Carmen: Suite #1 - Act 1 Prelude "Les toréadors"
A selection of Great Marches is a fun surprise – some of these recordings are new to CD (SMK63154). These were recorded between 1965 and 1971, and they find Bernstein in a swaggering and exuberant mood. Tempos are generally much too brisk for real marching, but the conductor finds the right sound for the different styles – brassy and glittering for Sousa, more traditionally orchestral for marches by Hindemith, Meyerbeer, Verdi, and others. The performances are spontaneous, at times almost to the point of sloppiness. A variable lot, then, but these discs don't misrepresent Bernstein's wide-range and dedicated musicianship. For collectors on a limited budget, though, I recommend the Barber/Schuman, Schuman, and Foss discs because of their unusual repertoire. The Mahler Second and the march disc would be welcome supplements. Now Sony, where are Debussy's The Martyrdom of Saint Sebastian, Goldmark's Rustic Wedding Symphony, Blitzstein's Airborne Symphony, Randall Thompson's Second Symphony… ?